This name uses Portuguese naming customs. The first or maternal family name is Vieira and the second or paternal family name is de Sousa. Givanildo Vieira de Sousa (born 25 July 1986), known as Hulk (Brazilian Portuguese: [ˈhuwki]), is a Brazilian professional footballer who plays for Shanghai SIPG as a forward, though he can also operate as a winger. After starting out professionally with Vitória and thenplaying three years in Japan, he went on to play several seasons in Portugal with Porto, winning ten titles – including the 2010–11 UEFA Europa League and three national championships – and being crowned the league's top scorer once. In 2012, he joined Russian Premier League side Zenit Saint Petersburg for €60 million, winning all three domestic honours and being named the competition's best player and being top scorer, once each. He was transferred to Shanghai SIPG for an Asian record €58.6 million in 2016. Hulk made his international debut in 2009, and played for Brazil at the 2012 Summer Olympics as one of the three permitted over-age players. He went on to represent the Brazilian senior team in their victory at the 2013 FIFA Confederations Cup and fourth-place finish at the 2014 FIFA World Cup. He is described by FIFA's official website as "a direct powerhouse of a centre- or wide-forward who knows his way around the box". He is strongly built for a footballer and acquired his nickname due to his likeness to actor Lou Ferrigno, who played the Incredible Hulk on the eponymous television show in the 1970s. Born in Campina Grande, Paraíba, Hulk started playing professionally with Esporte Clube Vitória in Salvador, Bahia, then went on loan to Japan to play for Kawasaki Frontale. Despite having been purchased on 15 January 2006, he was loaned to second division Consadole Sapporo, effective on 1 February, where he played all the 2006 season and scored 25 goals, one less than the top scorer. In 2007, he was loaned again to a second division team, Tokyo Verdy, where he was even more effective, scoring 37 goals in 42 matches and being the top goalscorer of the season. He briefly returned to Kawasaki in 2008, but rejoined Verdy after only 18 matches. After Hulk's stay in Japan, he moved to Portugal to join defending champions Porto, who purchased 50% of his playing rights for €5.5 million from Uruguayan side Rentistas, with the transfer fee being received by an unnamed investor. When Moroccan teammate Tarik Sektioui suffered an injury, Hulk was given an opportunity to play forward and scored his first official domestic league goal for Porto in a 2–0 home win against C.F. Os Belenenses, later adding against F.C. Paços de Ferreira (same venue and result), both as a second-half substitute. As the season advanced, he became an undisputed starter, forming an attacking trio with Cristian Rodríguez and Lisandro López, with the trio often shifting positions. After some stellar performances in the season's UEFA Champions League, he was elected as one of the Top 10 Rising Stars by UEFA.com. In late August 2009, he extended his contract to June 2014, with a buy-out clause increased to €100 million. In the 2009–10 season, Hulk established as an automatic first-choice. However, following a tunnel brawl during the league loss against S.L. Benfica (1–0) on 20 December 2009, he received a four-month ban (if the disciplinary hearing upheld the ban, he faced up to three years on the sidelines), only for the domestic competitions, as did his teammate Cristian Săpunaru. The ban was later reduced to four matches, and the player returned to league action on 28 March 2010, scoring in a 3–0 win at Belenenses. One week later, he also scored in a 4–1 home victory over C.S. Marítimo. With six less matches played than the previous season, he ended with five league goals. Hulk started the 2010–11 season scoring 16 times in his first 16 official matches, including a hat-trick against K.R.C. Genk in the UEFA Europa League play-off stage, on 26 August 2010 (4–2 home win, 7–2 on aggregate). From September to January, he won the Portuguese Championship Player of the Month, making him the only player to have won the award six times. On 7 November 2010, he scored the last two goals as Porto trounced Benfica 5–0 at home, creating a ten-point difference between the two teams, with the northerners leading the league, and eventually winning it, with the player leading the goalscoring charts. On 13 May 2011, Porto paid €13.5 million to Rentistas for another 40% of Hulk's playing rights, bringing their total stake to 85% (Porto sold back 5% after renewing his contract in 2009), with the player signing a new contract valid until 2016 and with a buy-out clause of €100 million. He finished the season with 36 goals in 53 official matches, with his team winning four major titles, including a league/cup double. On 7 April 2012, Hulk scored the solitary goal as Porto defeated S.C. Braga away to go four points clear at the top of the Primeira Liga table. He scored six goals in the following three matches, including a brace in a 2–0 home defeat of Sporting CP, and finished the 2011–12 season with 16 league goals as his team won another national championship. In May 2012, he was voted the Player of the Month for April for a record sixth time, and he added 11 assists, a competition best. On 17 February 2014, Hulk was ordered to pay a €45,000 fine for assaulting two stewards at the Estádio da Luz. On 3 September 2012, Hulk completed a transfer of €60 million, with Porto receiving €40 million,[fn 1] to Russian Premier League club FC Zenit Saint Petersburg, reuniting with former Porto teammate Bruno Alves. This transfer fee caused a lot of debate and a great stir since Mitrofanov, General director from Zenit denied publicly. Russian media R-Sport even claimed that Mitrofanov had shown the media the sales contract and the fee on the contract was €40 million and not €60 million. However, Porto also confirmed in its unaudited quarterly report in Q1 2012–13 that the club did not pay for third parties ownership (15%), agent fee nor solidarity contribution (5%), which all normally included in the transfer fee, as in the case of Radamel Falcao. 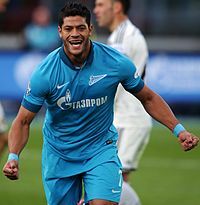 Hulk scored his first goal for his new club in only his second league match, against FC Krylia Sovetov Samara, finding the net with a trademark shot from outside the box in a 2–2 away draw. In the second half of September, media speculation reported that teammates Igor Denisov and Aleksandr Kerzhakov were unsatisfied with Hulk's wage, and that they demanded renegotiation of their contracts. As a result, they were sent to the youth squad. Denisov replied in an interview with Sport Express stating that his stand-off with club management was over "the proper organisation of the team. And respect for the Russian players which Zenit has always relied upon". A few days after the feud, he scored and assisted in a 2–1 win against FC Baltika Kaliningrad for the fifth round of the Russian Cup. A few weeks later, he scored his first Champions League goal for Zenit and provided an assist in a 3–2 loss against A.C. Milan in the second matchday of group stage. After falling out with head coach Luciano Spalletti, Hulk declared he was seeking to leave the club in January. However, FIFA regulations ban players from playing for more than two clubs in a season, forcing him to stay in Russia at least until June 2013. Eventually, he revealed he made amends with the club's management and that things have been resolved. In a 3–1 loss against Ukrainian side Shakhtar Donetsk, he suffered a head injury after falling under a challenge and connecting his head with a Shakhtar defender's studs in the second half. He was then taken to a local Dubai hospital Following Zenit's third-place finish in the Champions League group stage, the club entered into the Europa League. He scored a goal in each leg of Zenit's knockout phase match to eliminate English side Liverpool from the Europa League in the round of 32 by away goals, despite losing 3–1 in the second leg. On 4 May 2013, he scored his first hat-trick of his Zenit career and assisted a goal, in a 4–0 win over league strugglers Alania Vladikavkaz. On 16 February 2015, Hulk signed two-year contract extension with the club. On 17 May, his free kick in a 1–1 draw at FC Ufa gave Zenit the league title with two matches to spare. Hulk was due to be an assistant at the draw for 2018 World Cup qualification in Saint Petersburg, but withdrew due to commitments with Zenit, being replaced by Alexey Smertin. Hulk was named by UEFA as one of the top XI players of the 2015–16 UEFA Champions League group stage. On 30 June 2016, Hulk joined Chinese club Shanghai SIPG from Zenit for a reported £45 million, an Asian football record. He would earn £320,000 per week, accumulating to £16.6 million per year. On 10 July, Hulk forced Ryan McGowan's own goal nine minutes into his debut in a 5–0 win over Henan Jianye. However, just 12 minutes later, he was stretchered off the pitch with a muscle injury. On 9 September, Hulk scored his first two goals for Shanghai SIPG against Beijing Guoan after a two-month injury lay-off. Hulk playing for Brazil at the 2014 FIFA World Cup. Hulk made his debut for Brazil on 14 November 2009 in a friendly match against England in Doha, as the Seleção managed a 1–0 victory. On 26 May 2012, he scored his first three international goals in a 3–1 win against Denmark at the Imtech Arena, Hamburg. On 9 June 2012, in a friendly with Argentina, Hulk scored in a 3–4 loss. In July, he was named as one of three overaged players for Mano Menezes' Brazilian squad for the 2012 Summer Olympics in London, and he appeared in all but one of the matches during the tournament, netting in the 1–2 final loss against Mexico. In June 2013, Hulk represented Brazil at the 2013 FIFA Confederations Cup. He played in every match as the team's starting right-winger, including the final, where Brazil defeated world champions Spain to win its fourth Confederations Cup title. At the 2014 World Cup, in the round of 16 match against Chile in Belo Horizonte, Hulk had a goal disallowed for a handball. In the shootout, he had his penalty saved by Claudio Bravo, although Brazil nonetheless advanced. As of 5 April 2019. ^ "2014 FIFA World Cup Brazil: List of Players" (PDF). FIFA. 11 June 2014. p. 6. Retrieved 10 July 2014. ^ "Hulk". Retrieved 12 March 2016. ^ "HULK". FIFA. Retrieved 13 June 2014. ^ "The best (and worst) nicknames in football". 17 August 2011. Retrieved 14 June 2016. ^ フッキ選手獲得のお知らせ (Press release) (in Japanese). Kawasaki Frontale. 10 February 2005. Retrieved 7 November 2017. ^ a b フッキ選手移籍のお知らせ (Press release) (in Japanese). Kawasaki Frontale. 15 January 2006. Retrieved 7 November 2017. ^ フッキ選手期限付き移籍加入のお知らせ(1/9) (Press release) (in Japanese). Tokyo Verdy. 9 January 2007. Retrieved 7 November 2017. ^ フッキ選手期限付き移籍期間満了のお知らせ (Press release) (in Japanese). Tokyo Verdy. 19 December 2007. Retrieved 7 November 2017. ^ フッキ選手加入のお知らせ(4/2) (Press release) (in Japanese). Tokyo Verdy. 2 April 2008. Retrieved 7 November 2017. ^ フッキ選手移籍のお知らせ(7/27) (Press release) (in Japanese). Tokyo Verdy. 27 July 2008. Retrieved 7 November 2017. ^ "Comunicado" [Announcement] (PDF) (in Portuguese). FC Porto. 25 July 2008. Archived from the original (PDF) on 13 August 2010. Retrieved 25 September 2010. ^ "Top ten rising stars". UEFA.com. 9 March 2009. Retrieved 13 April 2009. ^ "Comunicado" [Announcement] (PDF) (in Portuguese). FC Porto. 21 August 2009. Archived from the original (PDF) on 31 December 2010. Retrieved 18 May 2011. ^ Barlow, Matt (17 February 2010). "The ineligible Hulk is desperate to take his frustration out on Arsenal". London: Daily Mail. Retrieved 18 February 2010. ^ "Andre Villas-Boas: "This victory has a special taste for us"". PortuGOAL. 8 November 2010. Archived from the original on 25 August 2011. Retrieved 24 April 2011. ^ Acedo, Francisco (17 May 2011). "Porto rule out Hulk sale". Sky Sports. Retrieved 18 May 2011. ^ "Futebolistas do FC Porto condenados no caso do túnel da Luz" [FC Porto footballers condemned in tunnel of light case] (in Portuguese). Expresso. 17 February 2014. Retrieved 15 September 2014. ^ "FC Porto: jogadores condenados no caso do "túnel da Luz"" [FC Porto: players condemned in the "tunnel of Light" case] (in Portuguese). Sapo. 17 February 2014. Archived from the original on 15 September 2014. Retrieved 15 September 2014. ^ "Túnel da Luz. Futebolistas condenados a indemnizar "stewards"" [Tunnel of Luz. Footballers condemned to indemnify stewards] (in Portuguese). iOnline. 17 February 2014. Retrieved 15 September 2014. ^ Nunes, Luís Miguel (3 September 2012). "OFICIAL: Hulk troca FC Porto por Zenit". Relvado (in Portuguese). Archived from the original on 5 September 2012. Retrieved 15 February 2013. ^ Avakyan, Samuel; Championat.com (5 September 2012). "Maxim Mitrofanov: "We`re going to pay 40 million for Hulk"". FC Zenit. Retrieved 15 February 2013. ^ "Hulk and Witsel Cost €40 M Each – Zenit". RIA Novosti. 6 September 2012. Retrieved 30 May 2013. ^ "Zenit St Petersburg spend £64m to sign Hulk and Witsel". BBC Sport. 4 September 2012. Retrieved 30 May 2013. ^ a b "Zenit's $130m dilemma". ESPN FC. 24 September 2012. Retrieved 24 September 2012. ^ "Zenit: Denisov went on strike over pay". RIA Novosti. 23 September 2012. Retrieved 26 September 2012. ^ "Igor Denisov sent to Zenit`s youth squad". Zenit Football Club. 23 September 2012. Retrieved 26 September 2012. ^ "Hulk has no hope of leaving Zenit in Jan". ESPNFC. 5 December 2012. ^ "Hulk: I have resolved my differences with Zenit". Goal.com. 7 December 2012. Retrieved 5 June 2013. ^ "Zenit's Hulk taken to hospital after head injury". Samba Foot. 23 January 2013. Retrieved 5 June 2013. ^ "Liverpool 3–1 Zenit St Petersburg (agg 3–3)". BBC Sport. 21 February 2013. Retrieved 5 June 2013. ^ "Hulk nets hat-trick as Zenit beat Alania 4–0". Samba Foot. 5 May 2013. Retrieved 5 June 2013. ^ "Hulk extends Zenit St Petersburg contract by two years until the summer of 2019". Sky Sports. 16 February 2015. Retrieved 16 February 2015. ^ "FC Ufa 1-1 Zenit St P". BBC Sport. 17 May 2015. Retrieved 17 May 2015. ^ "Hulk pulls out of World Cup qualifying draw in St Petersburg". Sky Sports. 24 July 2015. Retrieved 26 July 2015. ^ "Champions League team of the group stage: Ronaldo leads UEFA XI". Retrieved 14 June 2016. ^ uefa.com (15 December 2015). "UEFA Champions League - News – UEFA.com". Retrieved 14 June 2016. ^ "Brazil striker Hulk joins Shanghai in £320,000-a-week deal". Associated Press. 30 June 2016 – via The Guardian. ^ "Hulk marca em estreia na China, sofre lesão e rodada tem show de brasileiros" (in Portuguese). Globo. 10 July 2016. Retrieved 10 July 2016. ^ 屋漏偏逢连夜雨！胡尔克首秀进球被认定对手乌龙 [A series of unfortunate event: Hulk debut goal was corrected as own goal] (in Chinese). Sina. 10 July 2016. Retrieved 11 July 2016. ^ "Shanghai Hulk hailed by Sven-Goran Eriksson after netting brace". ESPN FC. 10 September 2016. Retrieved 12 September 2016. ^ White, Duncan (14 November 2009). "England 0 Brazil 1: match report". The Daily Telegraph. ^ "Brazil 3 Argentina 4: Hat-trick hero Messi steals the show in thriller". London: Daily Mail. 9 June 2012. ^ "Hulk, Marcelo named in Brazil squad". FIFA.com. 5 July 2012. Retrieved 12 August 2012. ^ "Peralta's double secures gold for Mexico". FIFA.com. 11 August 2012. Retrieved 13 August 2012. ^ Ornstein, David (28 June 2014). "Brazil 1–1 Chile". BBC Sport. Retrieved 28 June 2014. ^ "Hulk". Soccerway. Retrieved 20 September 2018. ^ "В списке 33-х лучших девять игроков ЦСКА". Retrieved 14 June 2016. ^ "Champions League team of the group stage". UEFA. 15 December 2015. Wikimedia Commons has media related to Hulk (footballer).